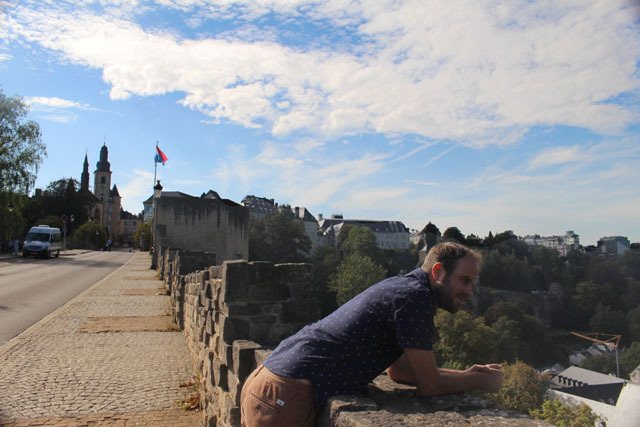 When thinking about the things we wanted to do in Europe this time around, one of our high priorities was making it to Belgium and Luxembourg. 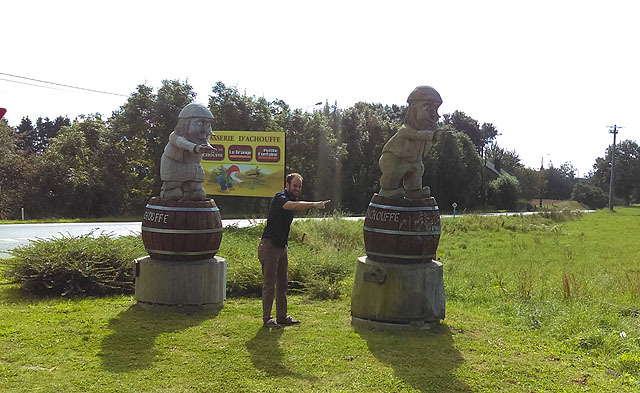 Andrew's parents had done a road trip around Belgium a few years ago and it seemed like a great way to see the smaller breweries that freckled the country. 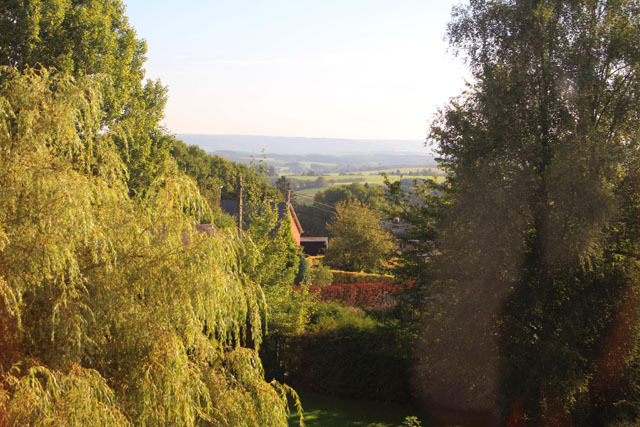 So we rented a car in Paris and made our way north to the country that's the only oasis of good beer in the otherwise barren land of Europe. French countryside on our way to Belgium (from the car window). 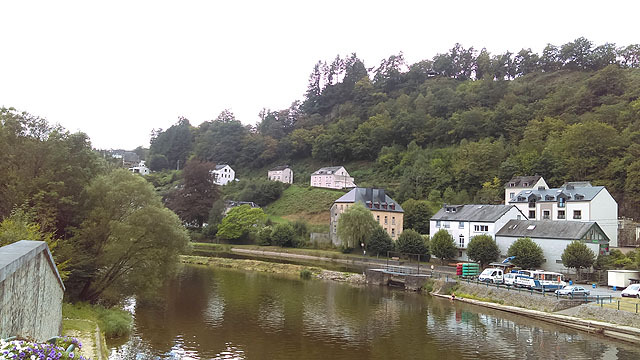 Our first stop was in southern Belgium in the town of Bouillon. They beer was called Godfred in honor of Godfrey of Bouillon who was a knight in the first Crusade who became the first ruler of the Kingdom of Jerusalem. We were there on a Sunday and a mountain bike race was going on. The streets were packed with cars and people on mountain bikes. We only stayed in the idyllic valley for a drink, before heading of to our next destination, Rochefort. Rochefort is the closest city to the Rochefort Abbey, where they brew the Rochefort Trappist beer. A Trappist beer is a beer made at a Trappist monastery, but there are only ten in the world, eight of which are in Belgium. It came in a 6, 8 & 10, with the numbers relating to their alcohol content, and once again the theory was proven: more alcohol, more taste. 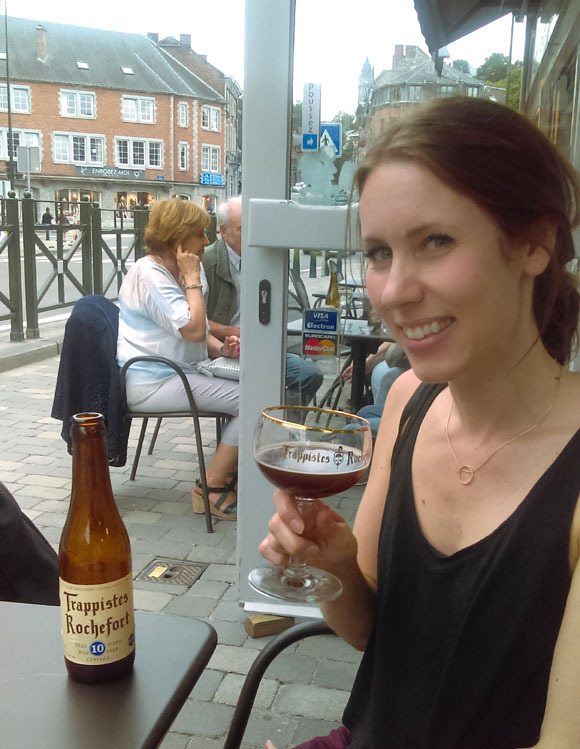 Maggie enjoying a Rochefort 10 in Rochefort. The next day we left Belgium for a quick foray into Luxembourg. 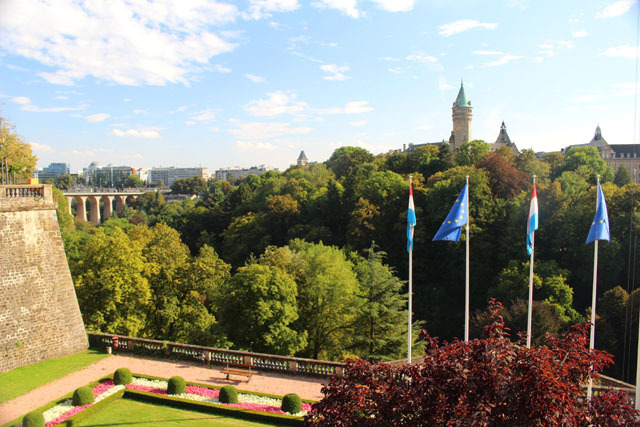 The reason we went to Luxembourg was not because of the city. 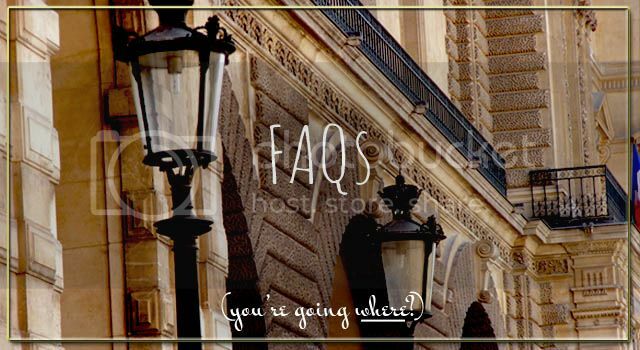 Don't get us wrong, the city was really great. It sat on a plateau above the surrounding land and was known as the most defensible spot in all of northern Europe of a thousand years - it's a very awesome city, almost like a Monaco of the north. 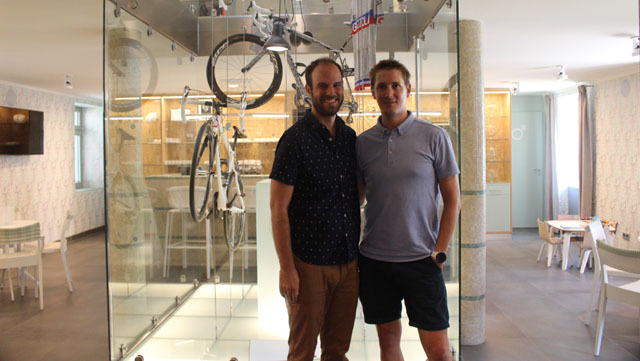 But the real reason we went there was so Andrew could meet one of his favorite professional cyclists: Andy Schleck. 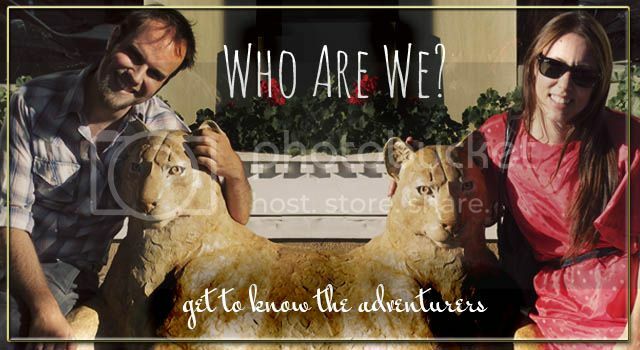 Andy had to retire from cycling a few years ago because of a knee injury, but since then he had opened up a bike shop in Luxembourg, and the word on the street was that he actually worked at the shop. There had been a fire, and the shop had been closed for six weeks, but it was having its grand reopening on the day we were in Luxembourg. Andrew meeting Andy Schleck. We actually talked to him for a while and he was the nicest guy. In the background is the bike he won the Tour de France on. 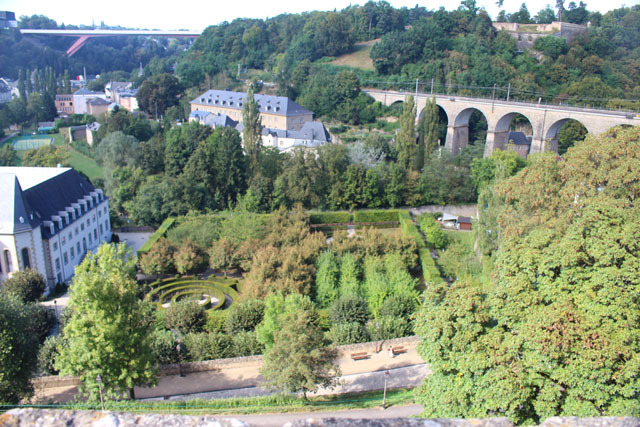 The gorge below the old city of Luxembourg, and also the location of our hotel, so we had a steep hike up to the city. On our way to the fortified city, with Andrew looking back down at our hotel. A view from the other side of the old city. It's a peninsula of high ground because of a river the winds around it. The next day after our short stay in Luxembourg, it was back to Belgium, and back to the beer. Our first stop was at the Brasserie D'Achouffe. It's a very popular beer in Belgium and has a wonderful brewery hidden in a deep valley. Their mascot is a elf picking hops and the place feels like somewhere elves would make beer. 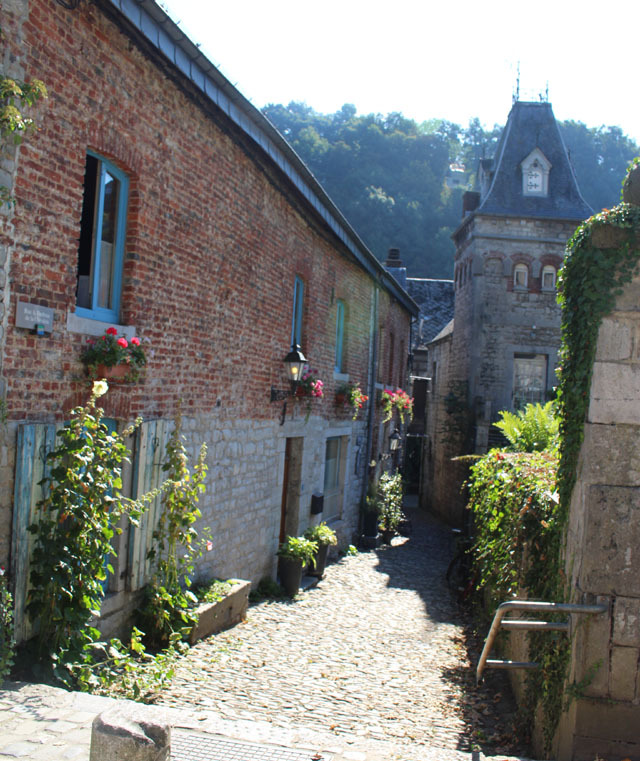 From D'Achouffe, we headed to Durbuy, known as the smallest town in the world. It's another old defensible town built in the middle ages, and it hasn't changed much since. It has tight little streets and old stone buildings, as well as it's own brewery (Durbuyose). 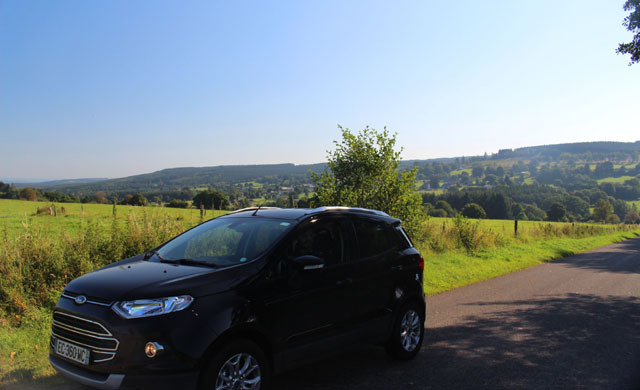 Our car on the road in Belgium. 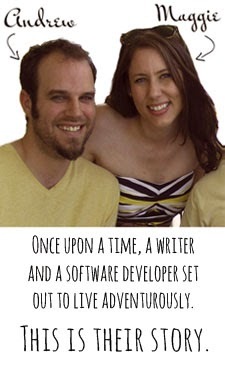 We had heard that Brussels was a fun town and decided to stay there for two nights - and we were very happy we did. 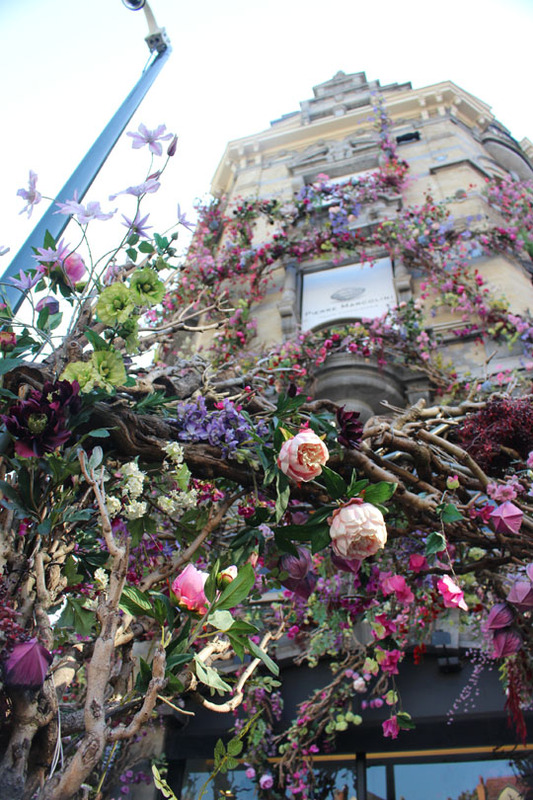 We loved Brussels--it felt like a mix of Paris and Berlin. There we old ornate buildings interspersed with modern clean buildings. And the beer... even the smallest of beer stores will have a selection of a hundred beers. The bars are even more amazing. Some bars have fifty beers on tap and a selection of hundreds of bottles - and they are all good. Bars in Belgium have another funny quirk: they will only serve a beer out of its own specific glass from its brewery. So those hundreds of beers a bar has? They each have their own glass. If someone else is drinking that beer, you just have to wait until they're done! 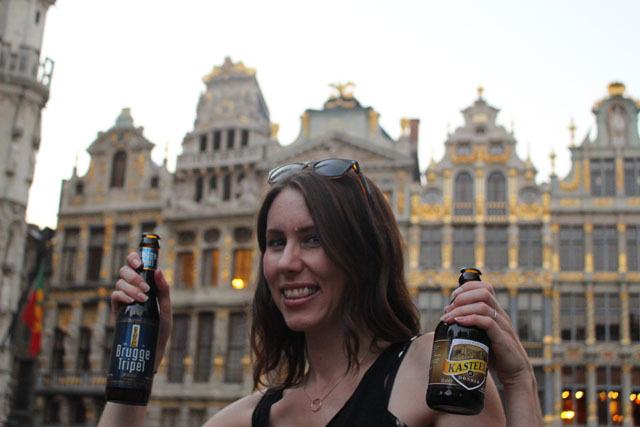 Brussels is a beer-lover's paradise, and a city we will for sure be going back to. Every Belgium beer has a particular glass its beer comes in. Meaning most bars have hundreds of different glasses. This statue of a little boy peeing (called the Manneken Pis) is the most famous sight in Brussels. For some reason. 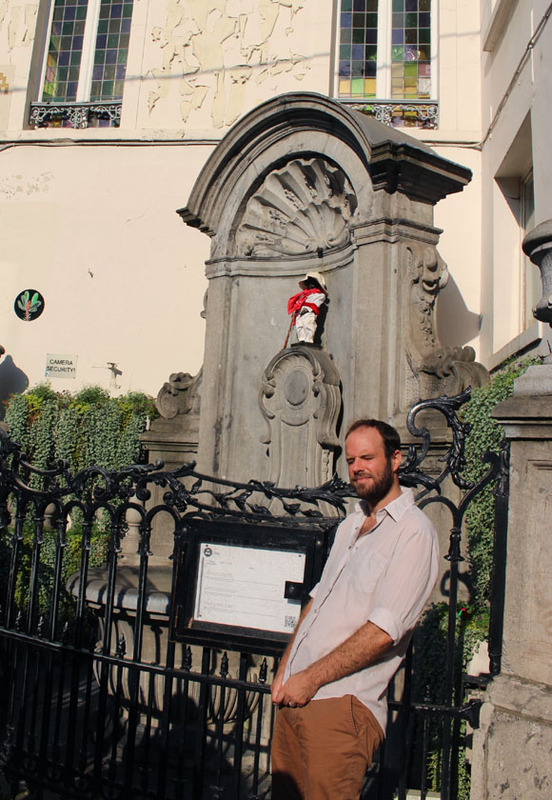 Here, Andrew is joining the Manneken Pis in relieving himself. There is a whole committee in Brussels that changes his outfit every day. 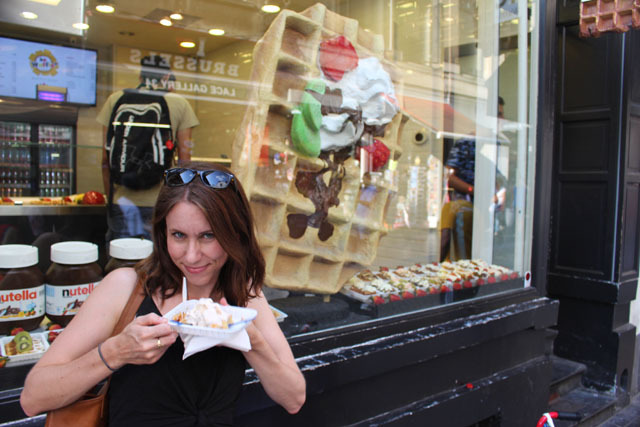 Maggie enjoying a Belgian waffle with ice cream. 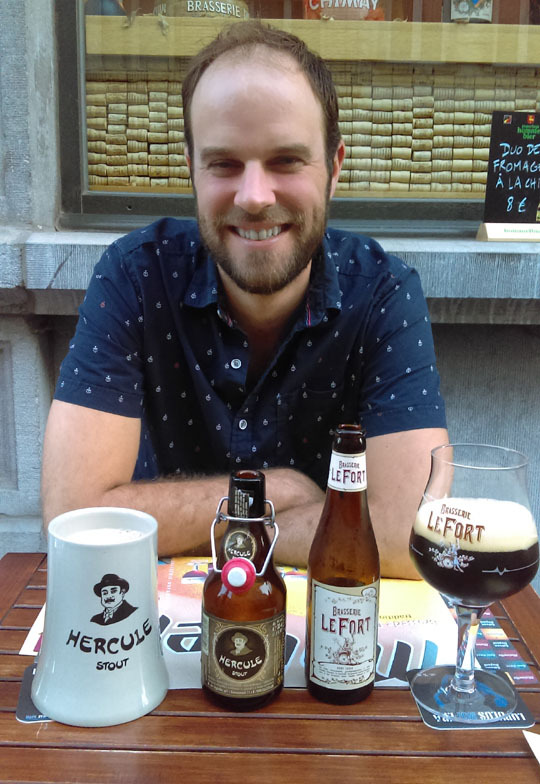 Drinking some great beers in Brussels' amazing city center. The city really is beautiful. 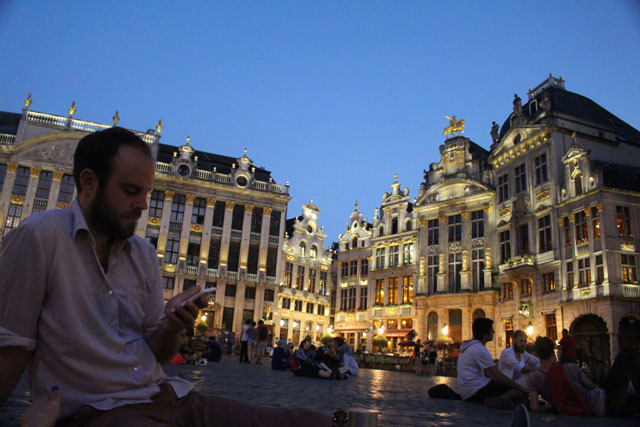 Andrew playing Pokemon in another epic place in Brussels. On our way out of Brussels, we stopped at the Cantillon brewery. It is one of the two places in the world still make beer with a process called wild fermentation, meaning they just open the windows and let wild yeast blow in to get the beer making process going. It was how all beers were made a few hundred years ago, and now their Lambic is one of the last. It's a bitter beer that is the missing link between wine and beer. 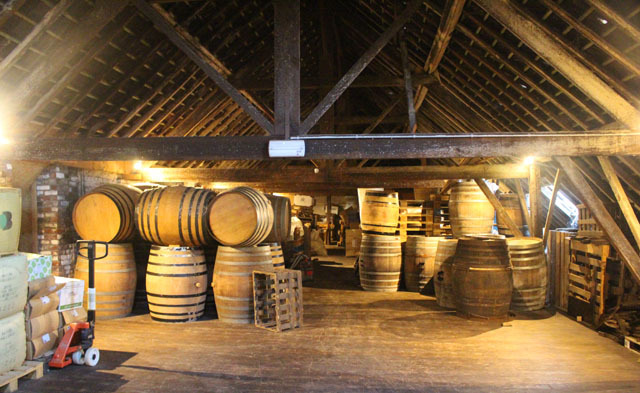 Lambic brewing in barrels in the roof of the brewery.